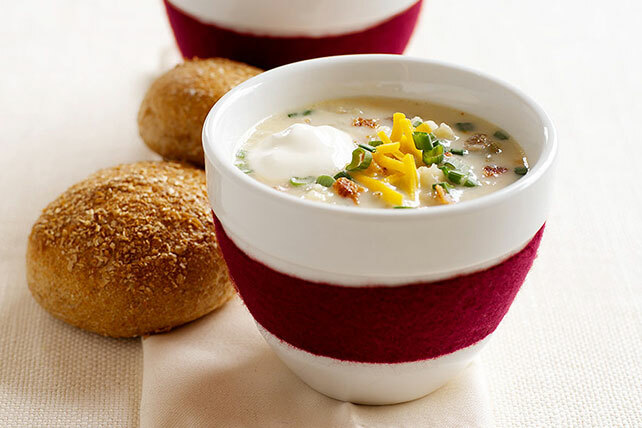 All the flavours of a baked potato, topped with "the works" in one quick and easy soup! Pierce potatoes. Microwave on HIGH 5 min., turning over after 2-1/2 min. Mix broth and milk in large microwaveable bowl. Add potatoes. Microwave on HIGH 6 min., stirring after 3 min. Mash potatoes lightly. Reserve 2 Tbsp. each bacon and cheese, and 1 Tbsp. onions; set aside. Stir remaining bacon, cheese and onions into soup. Serve this hearty soup with a quick bagged green salad tossed with your favourite Kraft Calorie-Wise Dressing. Substitute crumbled cooked regular bacon for the fully cooked bacon.